From designers Ottavio Ricchi and Lorenzo Striuli! In the summer of 1941, Italian dictator Benito Mussolini dispatched a corps of three divisions to fight alongside the Germans in their invasion of the Soviet Union. The CSIR arrived at the front in August and soon engaged in combat with the Red Army. 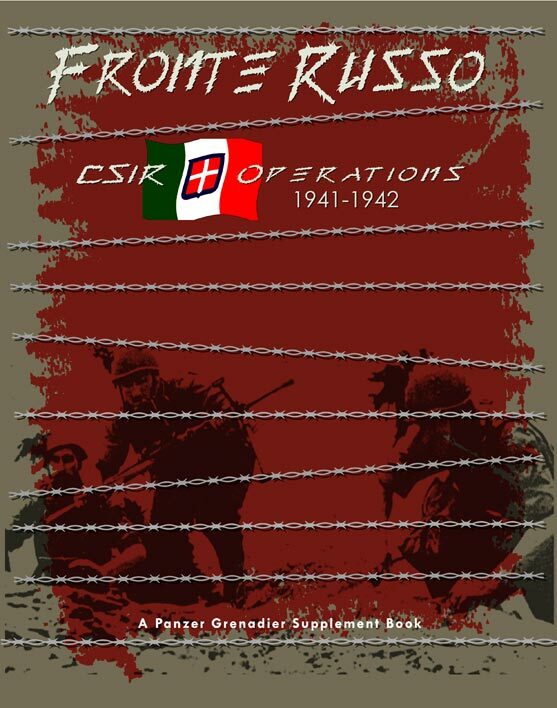 Fronte Russo brings background articles and scenarios covering these crack troops and their battles to the Panzer Grenadier game system. It is not playable by itself, but requires ownership of Eastern Front to play most of the scenarios, and Road to Berlin to play all of them. This is a book supplement complete with a full set of die-cut and mounted counters, much like Sinister Forces and East of Suez. Scenarios take place on the Eastern Front. The Italian divisions sent to Russia â€” the Pasubio and Torino infantry divisions and Duca dâ€™Aosta cavalry division â€” were well-trained units of the regular army, though not well equipped by most standards. Background articles place the scenarios in the full context of the Italian war in Russia. Italian troops have appeared in the Panzer Grenadier series before, in Afrika Korps and Desert Rats, but in Fronte Russo we provide a completely new set of playing pieces in â€œEuropeanâ€� colors rather than the desert schemes shown previouly. The Italian order of battle includes elite Bersaglieri light infantry, cavalry, light tanks, wagon-mounted â€œflyingâ€� artillery, flame-throwing engineers, and more.